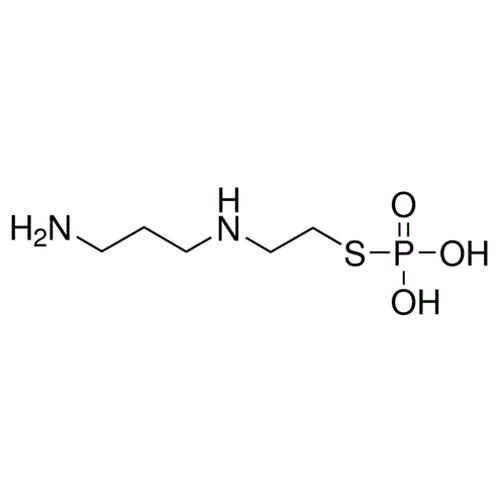 Representative figure legend Chemical structure of Amifostine (SIH-210), a Cellular protectant. CAS #: 20537-88-6. Molecular Formula: C5H15N2O3PS. Molecular Weight: 214.22 g/mol. Chemical structure of Amifostine, a Cellular protectant (SIH-210). CAS # 20537-88-6. Molecular Formula: C5H15N2O3PS. Scientific context Amifostine is a cytoprotective adjuvant used in cancer chemotherapy and radiotherapy. Inside cells it detoxifies reactive metabolites of platinum and alkylating agents (1, 2). Other effects include accelerated DNA repair (1), induction of cellular hypoxia (1), inhibition of apoptosis (2), alteration of gene expression (2) and modification of enzyme activity (2). Bibliography 1. Kouvaris J.R., Kouloulias V.E., Blahos L.J. (2007) Oncologist. 12(6): 738-747. 2. Amifostine: BC Cancer Agency. 2006-03-01.